Discussion in 'A Song For You: The Carpenters Forum' started by close2u40, Jul 20, 2016. Just announced over at IMWAN From The Vaults! No track list yet but they will update as soon as it's available. Thanks. Info added to our Resource. Interesting. I wonder what will be on this one. Kind of an odd title. 'The Nation's Favourite' is a UK TV series which features an artist each episode and counts down the nation's favourite song from 20 to 1, as voted for by TV viewers. A number of well known acts have featured previously, including the likes of ABBA, Queen and Elvis. Very popular here. I'm surprised however at this compilation if it's true. None of the other artists featured have had such a collection released after being featured and it makes no sense for it to be a compilation linked to that TV show...otherwise what would be the point of watching if you had the answer already in your hands in the form of a CD? Sounds like it's unrelated to the TV series to me. I'm thinking that the TV series would air BEFORE the release, meaning it would be in the next few weeks. According to the episode guides online, the first episode of a year seems to start in July. Can you UK folk check the TV schedules? Interesting. I'm not familiar with that series. I was assuming it was a cash-in on the recent "Karen Carpenter: Goodbye to Love" UK documentary. The Nation’s Favourite telling the stories behind many of the greatest songs of all time – hearing from the stars and songwriters who created them, and those who loved them. The Nation’s Favourite…has become the most popular music documentary series on British television. Ninety minute specials like The Nation’s Favourite Abba Song and The Nation’s Favourite Elvis Song both pulled in over 5m viewers on ITV – and in 2015 we told the story behind the Fab Four’s 27 No1 UK and US hits in The Nation’s Favourite Beatles Number One – Sir Paul McCartney and Ringo Starr even made an appearance. Other shows have included the RTS-winning The Nation’s Favourite Bee Gees Song, The Nation’s Favourite Queen Song, The Nation’s Favourite Motown Song and The Nation’s Favourite Bond Song – our latest special tells the story of The Nation’s Favourite Carpenters Song, with Richard Carpenter at the piano revealing the stories behind the hits. Nothing listed in the TV schedules over the next two weeks but I'll keep checking and report back. This sounds like a new interview filmed with Richard, I'm excited! The production company creating this has an amazing track record when it comes to documentaries, I have watched many of them. I'd say we're in for a treat. If the CD does follow the format of the show, then it's probably going to be a 20-track set (i.e. the 20 songs as voted for by the viewers). Eyewire, goodjeans and theninjarabbit like this. Wow, I hope to see this! It's curious that if Carpenters are getting a CD of their Top 20 in Britain, then why wouldn't Universal have also done the same for ABBA. All I can think of is that since ABBA was on the very first show, they hadn't yet thought of doing a tie-in CD. Maybe I'll answer my own question. If you take the list of ABBA songs on that first show and place them in order, the time comes out to 102 minutes. That would have required a double CD, and in fact all of these songs are already contained on the 2-disc set called THE ESSENTIAL COLLECTION (along with other tracks). If they'd wanted to do a single disc, they could have only fit the top 19, which time out at around 80 minutes, the limit of a CD. Interesting speculation and makes sense. So, applying that same logic could mean that there is a song or two in the countdown that are not included on any of the standard and available "best of" compilations. I wonder if there will be multiple Christmas songs on the list. Interesting analogy is that the original ABBA Gold was also 19 tracks long. A lot of ABBA's singles were longer than most Carpenters, such as Chiquitita (ca. 5 minutes), so they took up more room overall. Carpenters Gold, with shorter songs like Hurting Each Other, Please Mr Postman and Top Of The World will probably mean a 20 track compilation is easy. I'm a bit puzzled. Wikipedia suggests that ITV has a poll a few months beforehand for the public to vote for their favourite. I can't find any evidence of such a poll. They normally do it through TV magazines. This is great news! I hope to eventually see the documentary. I wonder what the cover for the CD will look like. To coincide with ITV’s upcoming program celebrating The Nation’s Favourite Carpenters songs, this is a 20 track collection of the UK’s favourite Carpenters songs Key tracks include ‘Yesterday Once More’, ‘(The Long To Be) Close To You’, ‘Please My Postman’, ‘Calling Occupants’ and many more. Sleevenotes include a full interview with Richard Carpenter. Jeff and Eyewire like this. Hmm...not wild about the cover image, but I can sort of see the logic of it. The tracklisting's got to be pretty similar to the UK single-disc Gold compilation hasn't it? I kinda like the cover, I'm digging the LP and the grooves and the label, different than any cover, I'm just not crazy about the title. Harry and Mark-T like this. The tracklisting's got to be pretty similar to the UK single-disc Gold compilation hasn't it? I reckon there will be a few surprises in there, otherwise it wouldn't be worth putting out if it was similar to Gold. I've a feeling album tracks like A Song For You may show up. I too like the cover artwork. It's got a sort-of 3D version of the logo (look at how the letters E and N are thinner, making them look recessed compared to the other letters, giving a sort of wrp-around effect). I'm also partial to anything that's faithful to old A&M label artwork - and on a gold record to boot! 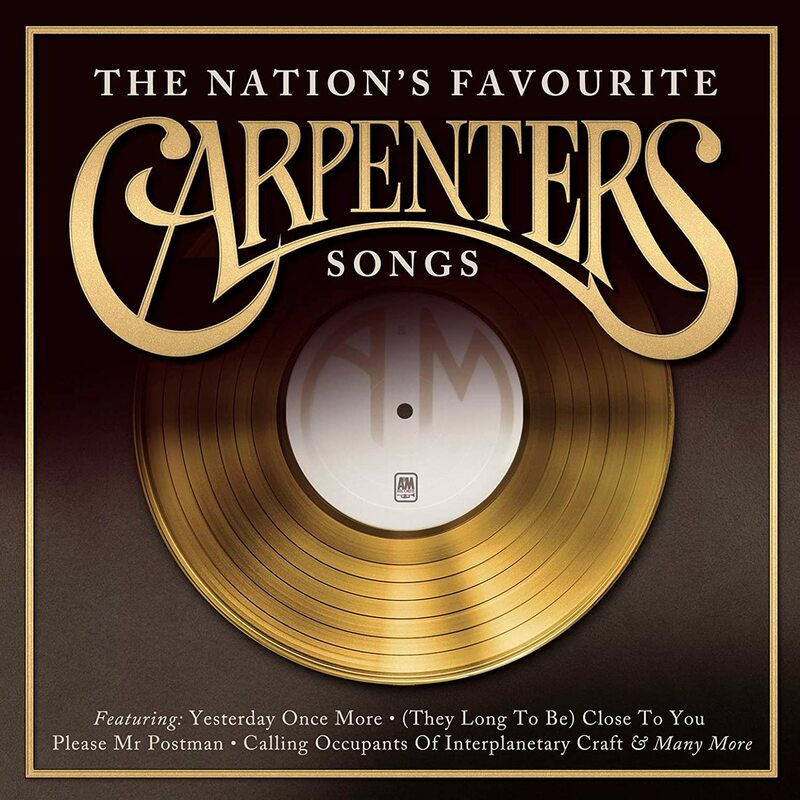 Great to see another incarnation of Carpenters' songs compiled for CD. And, I am glad that interest in Carpenters' music--at least in the UK--goes unabated. Regrettably, this will be another for which I have no intention of acquiring. (e.g., as with the PBS set). My CD collection stopped becoming bloated in 2014. I took another listen to Chris May's 2014 Interview with Richard Carpenter. It reinforces my decision to resist acquiring any more CD's. "all done." ( a quote we all remember). Murray and newvillefan like this. I wonder if we might see one of Karen's unreleased tracks make the disc, especially in light of the recent changes in EU copyright law. I wouldn't think so. If it's a poll of favorites, it would be hard for an unreleased track to be considered a favorite. I'm sure it'll be the standard list of 20 songs that have been anthologized time and again. Maybe there will be a surprise or two like there was in the Japanese BY REQUEST. And there's always the "which mix" game to play.